I was just introduced to the Bella Tunno website by my friends at Kandoo. (I love love love Kandoo products!!!) "Bella Tunno is a baby and children's NECCESSORY (necessary accessory) company." I've been clicking around their site... and boy do they know their stuff about "neccessories". Imagination Station Game Cards that help to foster conversation, fun and imagination. The simplistic design makes the kit (10" x 6") functional for diaper bags, purses, glove compartments, beach bags, or anywhere mom needs to keep a few tricks up her sleeve. How awesome does that little kit sound? I can tell you I'm disappointed that I no longer need a kit like this. When Zoe and Ana were infants and toddlers I used to keep all of this stuff in my diaper bag. Well... sort of all this stuff. The Bella Tunno stuff is much prettier than the stuff I carried around... and they put it in the cute little silver clutch that you can just toss in your diaper bag. I had it all in a gallon ziplock baggie (because I'm fashionable like that). It took me quite a while to figure out what exactly I needed to make dinners out easier with kids... and here Bella Tunno went and made it one stop shopping. So, while I can't really use this little Magic Kit myself... it looks like a pretty cool addition to any baby shower or new mom gift I might be giving. And with a price tag of $20 it's a pretty affordable addition! 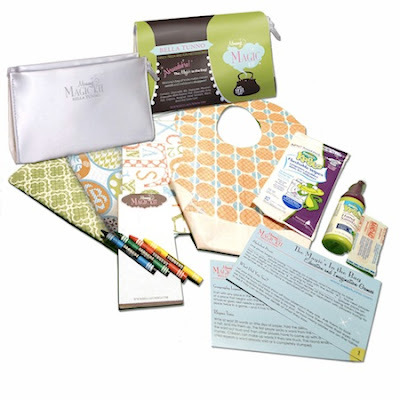 Right now Bella Tunno is also offering $5 off the Mommy's Magic Kit. The coupon code to use for this offer is mamasnofool and you can order directly from the Bella Tunno site. Shop quickly! The code is only good through Monday, April 2nd!! !